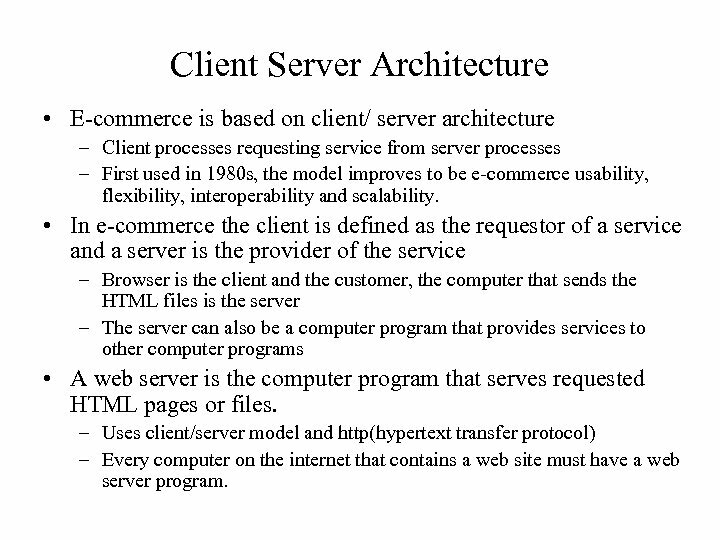 Client Server Architecture • E-commerce is based on client/ server architecture – Client processes requesting service from server processes – First used in 1980 s, the model improves to be e-commerce usability, flexibility, interoperability and scalability. 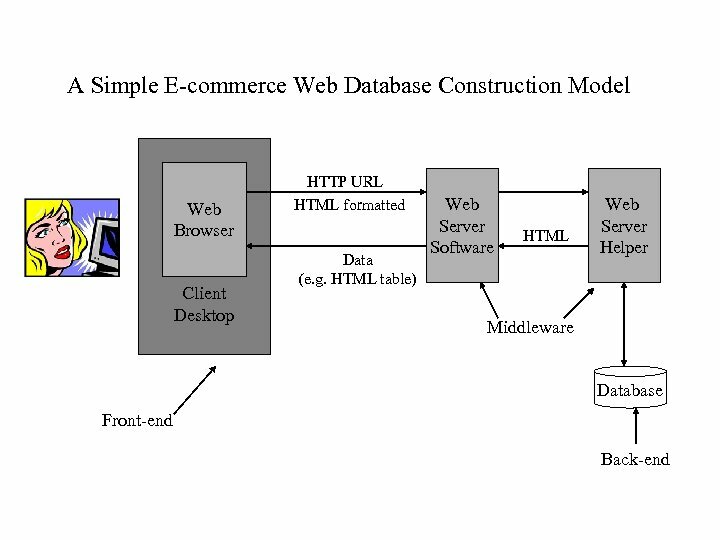 • In e-commerce the client is defined as the requestor of a service and a server is the provider of the service – Browser is the client and the customer, the computer that sends the HTML files is the server – The server can also be a computer program that provides services to other computer programs • A web server is the computer program that serves requested HTML pages or files. 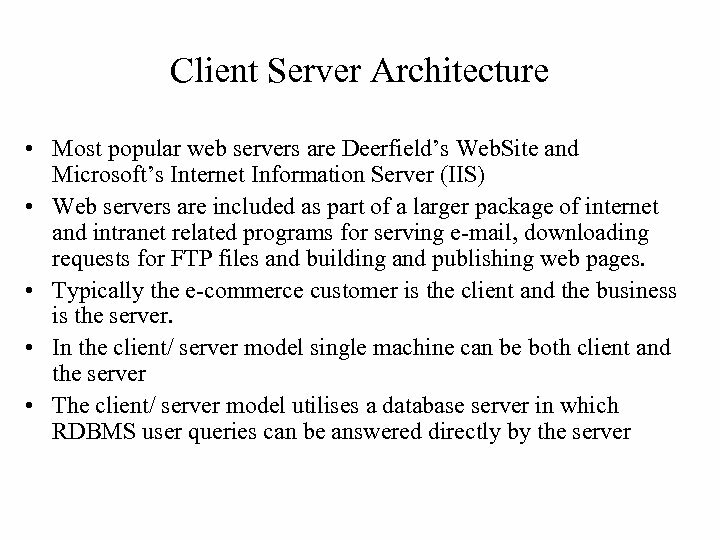 – Uses client/server model and http(hypertext transfer protocol) – Every computer on the internet that contains a web site must have a web server program. 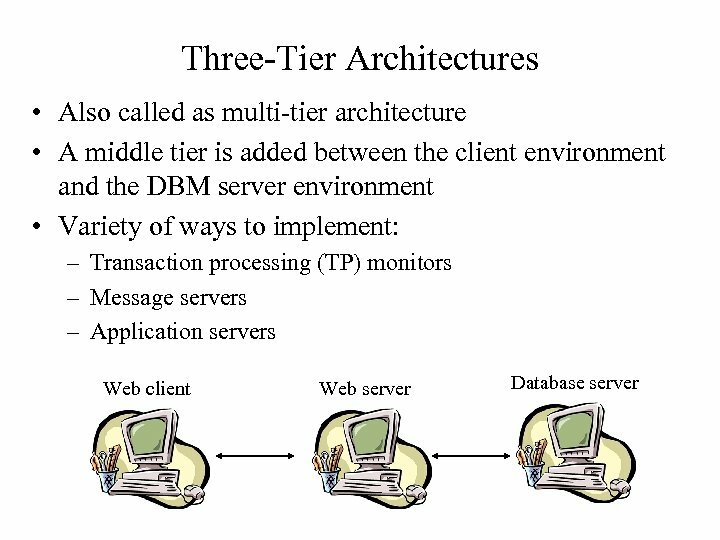 Client Server Architecture • The client/ server architecture reduces network traffic by providing a query response to the user rather than transferring total files. 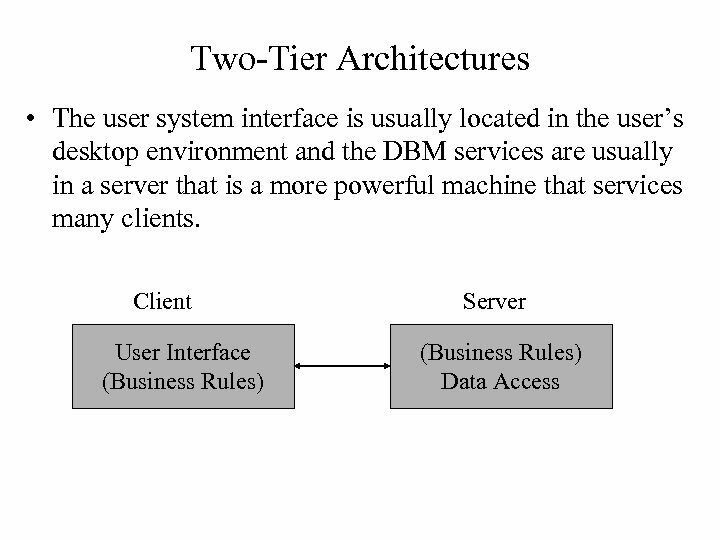 • The client/ server model improves multi-user updating through a graphical user interface (GUI) front end to the shared database. 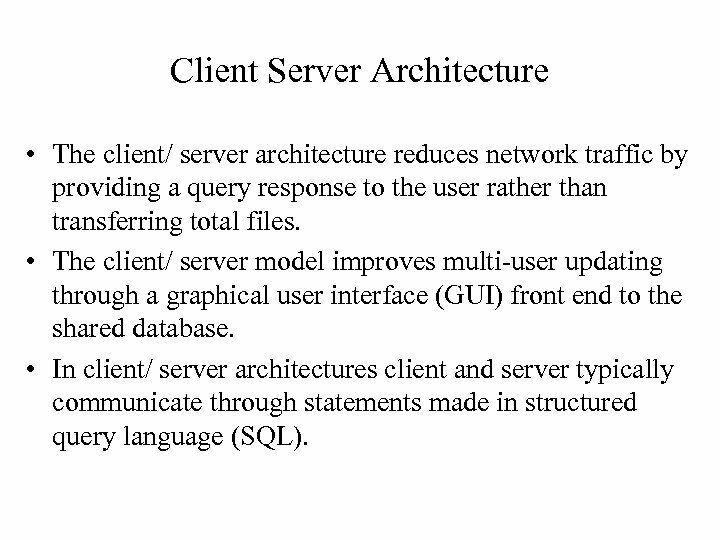 • In client/ server architectures client and server typically communicate through statements made in structured query language (SQL). 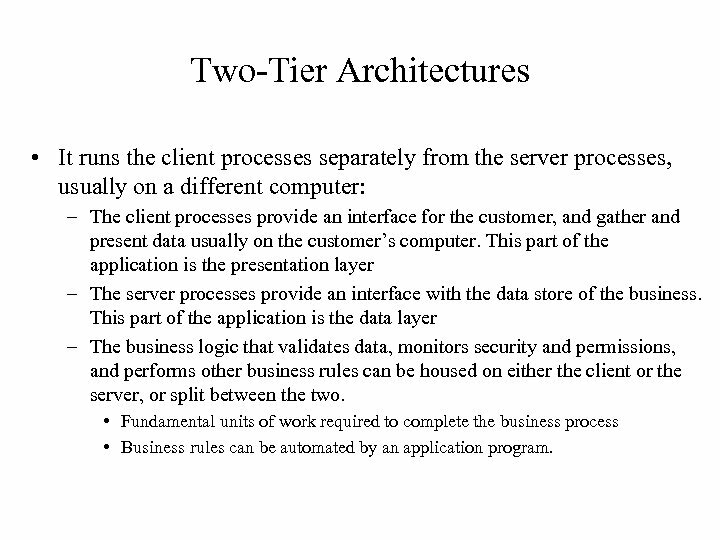 Two-Tier Architectures • It runs the client processes separately from the server processes, usually on a different computer: – The client processes provide an interface for the customer, and gather and present data usually on the customer’s computer. This part of the application is the presentation layer – The server processes provide an interface with the data store of the business. This part of the application is the data layer – The business logic that validates data, monitors security and permissions, and performs other business rules can be housed on either the client or the server, or split between the two. • Fundamental units of work required to complete the business process • Business rules can be automated by an application program. 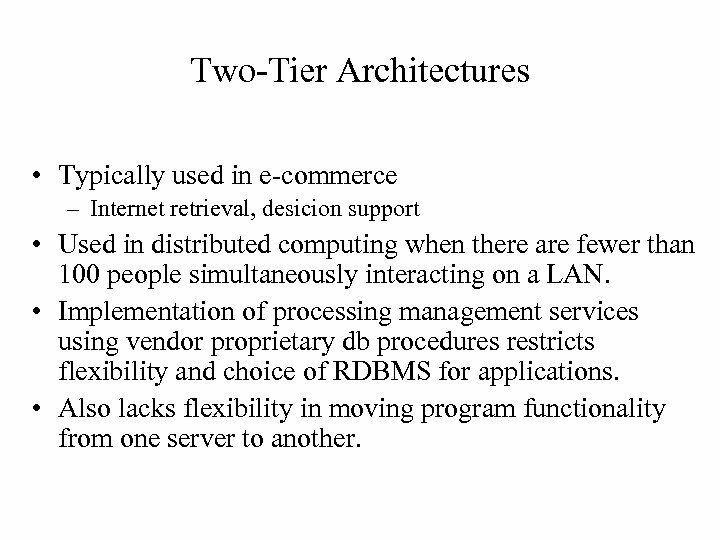 Two-Tier Architectures • Typically used in e-commerce – Internet retrieval, desicion support • Used in distributed computing when there are fewer than 100 people simultaneously interacting on a LAN. 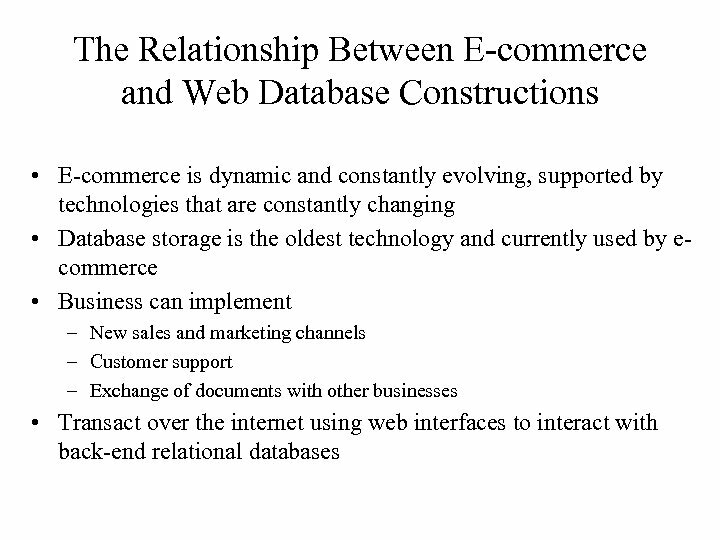 • Implementation of processing management services using vendor proprietary db procedures restricts flexibility and choice of RDBMS for applications. • Also lacks flexibility in moving program functionality from one server to another. 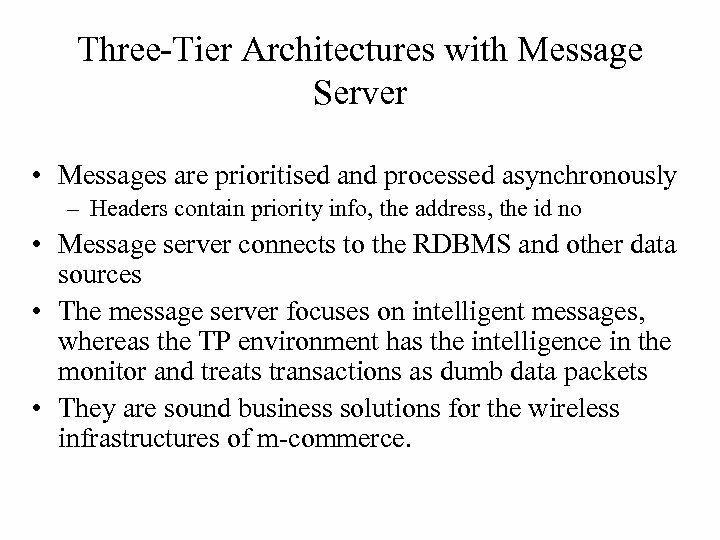 Three-Tier Architectures with Message Server • Messages are prioritised and processed asynchronously – Headers contain priority info, the address, the id no • Message server connects to the RDBMS and other data sources • The message server focuses on intelligent messages, whereas the TP environment has the intelligence in the monitor and treats transactions as dumb data packets • They are sound business solutions for the wireless infrastructures of m-commerce. 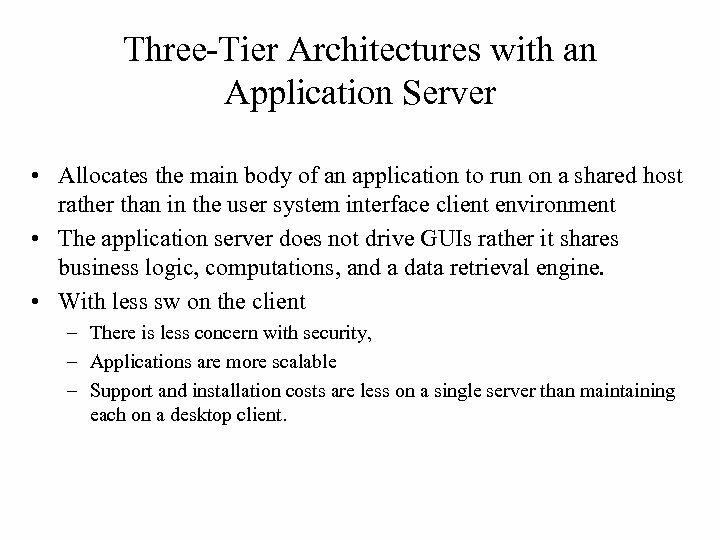 Three-Tier Architectures with an Application Server • Allocates the main body of an application to run on a shared host rather than in the user system interface client environment • The application server does not drive GUIs rather it shares business logic, computations, and a data retrieval engine. • With less sw on the client – There is less concern with security, – Applications are more scalable – Support and installation costs are less on a single server than maintaining each on a desktop client. 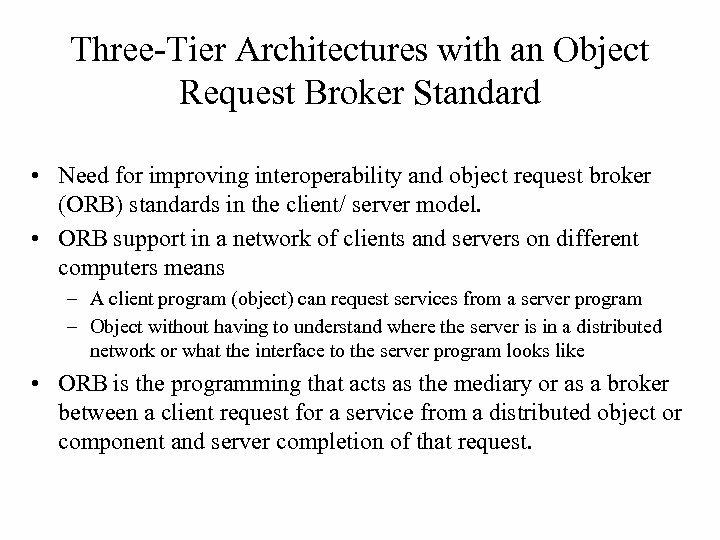 Three-Tier Architectures with an Object Request Broker Standard • Need for improving interoperability and object request broker (ORB) standards in the client/ server model. 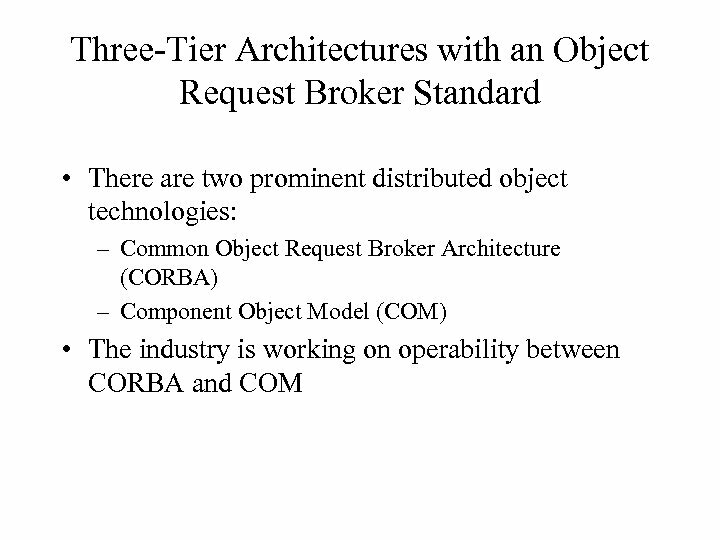 • ORB support in a network of clients and servers on different computers means – A client program (object) can request services from a server program – Object without having to understand where the server is in a distributed network or what the interface to the server program looks like • ORB is the programming that acts as the mediary or as a broker between a client request for a service from a distributed object or component and server completion of that request. 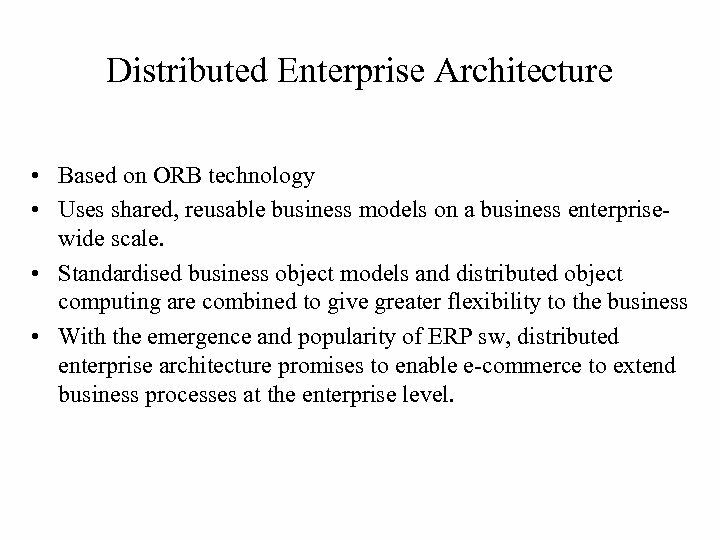 Distributed Enterprise Architecture • Based on ORB technology • Uses shared, reusable business models on a business enterprisewide scale. 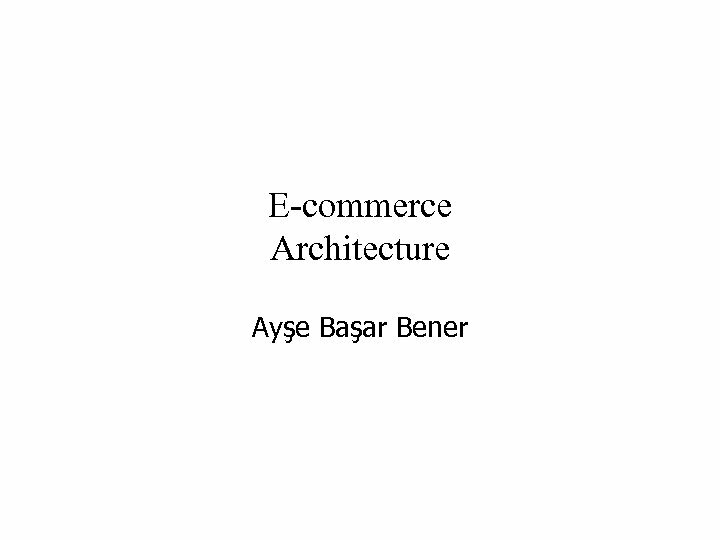 • Standardised business object models and distributed object computing are combined to give greater flexibility to the business • With the emergence and popularity of ERP sw, distributed enterprise architecture promises to enable e-commerce to extend business processes at the enterprise level.